Dental bridge: what is it and when to get one? A Dental Bridge is one the many tools a dentist has on their repertoire to replace missing teeth, this particular procedure is specially designed to replace several adjacent missing teeth without having to place several implants. Here is how it works; the dentist prepares what we call “abutments”, think of them as the pillars holding a bridge in place, most often an abutment is a filed teeth, but in certain cases implants are used, which one to use depends on several factors, such as: health of the teeth to be potentially used as abutments, bone density in the area and length of the bridge. 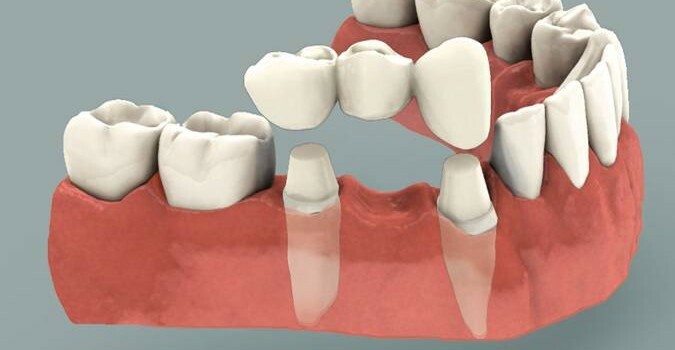 Afterwards, the abutments are covered by crowns connected by a pontic, which is one or more interconnected tooth prosthetics not affixed to your bones; that is precisely the reason while the procedure is known as a bridge, since the end result is like a hanging bridge held in place by two pillars or columns. Are you the right patient for a bridge? So, a dental bridge or implants, which one is better? Most dentists will usually recommend an implant over a fixed bridge, nevertheless, it´s not a simple this or that answer, if that where the case, we wouldn´t be using bridges anymore. Keep in mind that implants require surgery, and they usually take longer to place, since you have to extract the tooth, wait for the area to heal, place the implant and then wait for the final tooth, on the other hand, a dental bridge can be often placed on the same day, and if teeth are used as abutments no surgery is necessary, which in turn means a shorter recovery time. On the other hand, dental bridges are considerably less expensive than their counterparts, especially if you have to place several implants. So, in the end, if we are talking about a white-room case (that is, if we don´t consider every possibility) then implants tend to be the better choice, but, in reality, it will all depend on your needs and what the expert thinks is better for your particular case.